Upper Noe threw the best block party of the year on September 15 according to the Neighborhood Empowerment Network, an offshoot of the Mayor’s office of Neighborhood Services. Ten Together – Upper Noe Block Party will take the Extraordinary Block Party category. It was a community effort and the whole community shares in the success. 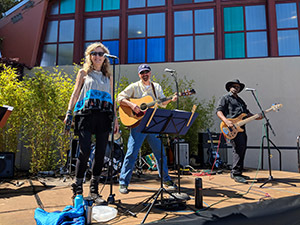 Come party with Upper Noe Neighbors in the City Hall Rotunda on Wednesday, February 6 from 6 – 8:30 pm. The event is free but your RSVP helps organizers make sure there is enough food and drink. Sharing the limelight will be our own Ingleside Station commander Capt. Jack Hart, who is this year’s Most Empowering City Employee of the Year. Congratulations Captain! Join us for a budget meeting to discuss preliminary plans for Fiscal Years 2019-20 and 2020-21. Learn about our department’s Strategic Plan and our budget instructions for the next two years, and let us know what your priorities are in your neighborhood parks. Help keep Upper Noe in tiptop shape. When you see a need for some maintenance, call San Francisco Customer Service Center (311), visit sf311.org or download the 311 app. Email info@noevalleyreccenter.com with any questions or suggestions. Share this newsletter to your friends and neighbors. Please help us to promote Upper Noe Recreation Center as your neighborhood center and to connect with all members of the community.